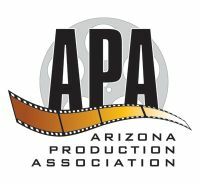 The APA is excited to present these opportunities for individuals and business owners to promote themselves and their companies while also showing their support of female filmmakers and independent films in Arizona! In-Kind Sponsorships are also welcome. Sponsors providing in-kind goods or services will receive recognition at the sponsorship level that most closely matches the value of the goods or services being provided by the Sponsor. We are seeking in-kind sponsors for event photography and program printing. Sponsors are responsible for providing the names, logos, text promos, banner ad artwork and other items needed to receive their recognition according to the sponsorship level and specifics and deadlines outlined by APA. If you're interested in being a sponsor, contact Judy Moore: judymoore100@gmail.com or Julie Lee: julie@azproduction.com ASAP so you'll receive the maximum amount of promotion time possible! Submissions of Shorts is also underway, so submit YOUR piece of 30 minutes or less today, and pass this on to your fellow filmmakers and potential sponsors! THANK YOU For Your Support of "Ladies 'Film' Night Out"!